The form below is a fast and easy way to order replacement parts for your Kiddie Kruzzer® strollers. Simply complete the form to send your request; we will follow up with a price quote before we ship your order. If you don’t see the part you need, are interested in additional information, or would like to talk to our Customer Service Representative please give us a call at 651-653-3024. 120124 Security pole kit (includes all hardware) 68"
A Few Words From Our Customers …. We were looking for an affordable option to provide patrons with strollers in our facility, without a large expense. The Kiddie Kab strollers fit our needs perfectly, plus the way they nest makes them space saving too. Best of all, out patrons love them! Thanks! The Kiddie Kruzzer line of strollers has been a great addition to our mall. Our customers really love them, and use them daily! They have been a great revenue generator for our mall … thanks SmarteCarte! 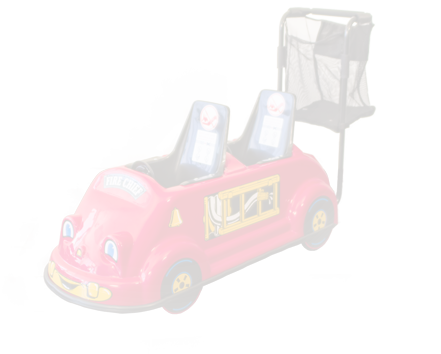 We’ve had our Kiddie Kruzzer Strollers for about two years, and parents love them! Their kids also love them, which is great for mom and dad since they are totally behaved. I love them too since it keeps our customers happy, plus it is a great passive revenue generator for us … a win, win, win!